It’s imperative that callers inspired by your marketing initiatives are transferred seamlessly to the most appropriate call center operator. 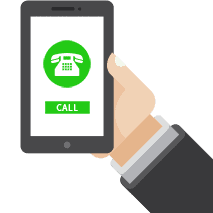 A single advertised call tracking number can be routed to a variety of termination points depending on your business requirements and those of the caller. Sophisticated call routing tailored to your needs will improve customer service, increase conversions and decrease missed calls. Traditionally call routing has been the domain of an IVR. You may recognize IVR menuing as a voice prompt that says, “press one for sales, press two for accounts, press three technical support,” and so on. The advantage of using Delacon’s IVR solution is that you can modify your IVR configuration with our easy-to-use interface and change the audio files as required. However with the inclusion of call tracking data, you could use this information to route the callers as deemed appropriate. This has the potential to increase the chance for converting the lead to a customer. For example, by using the keywords for each call, you could divert each lead to a specific operator or department that’s trained in that particular concept. For example, cheap product inquiries could go to a team devoted to deal hunters while quality product inquiries could go to a high end team.